...Most of my close friends—both of them—know that I’m a huge fan of hockey and baseball. It works out quite nicely that they run at different times of the year (for the most part), so there’s always something to hold my short attention span. ...Unfortunately, right now the National Hockey League is suffering what has become popularly called “another black eye.” Phoenix Coyotes assistant coach Rick Tocchet has been implicated in a national gambling ring that is said to have ties with mobsters and a clientele list that includes Janet Jones, the actress wife of Coyotes head coach—and hockey legend—Wayne Gretzky. 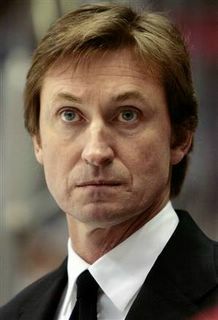 Gretzky was discovered to have made inquiries into possible ways to keep Jones out of trouble should the ring be investigated. ...Since I’m known for being critical of professional athletes who break the law or just do stupid things, it probably seemed odd that I haven’t commented on this topic sooner. It may have seemed as if I had been ignoring the issue, but in actuality I was just forming a solid opinion. ...To preface this, I want to say that I’m openly opposed to gambling laws, regardless of who is doing the gambling—from drunks playing a round of poker to rich stiffs wagering millions of dollars on the Super Bowl. If you’re dumb enough to risk losing your money, then you deserve whatever comes to you. ...When it comes to athletes, the only time that gambling should become illegal is when and if the athlete in question gambles against his own team and intentionally loses a game to collect on the bet. Take Pete Rose, for instance: He bet on his own teams on occasion, and then tried his hardest to ensure that they would win. Yes, as a person Rose was nothing more than a Neanderthal with talent (in 1999, then-NBC reporter Jim Gray received death threats for asking Rose questions about the gambling), but to his credit he wasn’t willing to lose games—even for a profit. ...Now that I’ve established that, it’ll make a little more sense when I suggest that Tocchet, Jones, and Gretzky should be vilified—if not crucified—for something other than their illegal acts (if the allegations prove to be true); they should be crucified for their sheer selfishness and unadulterated stupidity. ...The NHL suffered a massive public relations meltdown last season when an entire year was lost to a lock-out. Television ratings were on the decline even before the work stoppage, so the timing for a lock-out made things even worse. ESPN considered the lock-out (combined with commissioner Gary Bettman’s greed) to make the decision that they wouldn’t renew a TV contract for the league, leaving it to find a new home on the upstart OLN Network and a few games on NBC. ...Somehow and someway the fans returned with gusto, but now this new problem has emerged—this time with the help of Gretzky, who had become known as an ambassador to the entire sport of hockey. ...If the allegations turn out to be true, and if Tocchet and Jones were, indeed, part of this gambling ring with Gretzky acting as a look-out man, there would be no reason to not blame them for any dark clouds that might hover over the Coyotes for the rest of the season, Team Canada in the Turin Olympics (Gretzky is executive director of Team Canada), or over the NHL in general for the rest of the season. ...No matter which rink they’re in, or which league they’re in, any team with ties to Tocchet or Gretzky will experience whispers in the stands, on the blogs, and across the radio waves. No matter how quiet the whispers are, the players on these teams will hear them. Players always hear them. ...While I’ll continue to believe that gambling laws need to be re-evaluated, I’m still able to realize that it’s currently illegal to do it, and those who violate those laws are going to cause strain within their particular environment if they happen to be caught. When that environment is one on a national—if not global—stage, it becomes even more important to avoid the potential problem from the start. Because of that, Rick Tocchet, Janet Jones, and Wayne Gretzky should have used a modicum of common sense.